Discover the best of Rome with this perfect sightseeing combo ticket. Using your unlimited hop-on, hop-off bus pass, tour the city aboard Rome’s quintessential double-decker, pink bus, and conveniently stop at the city’s top attractions. In Vatican City, get skip-the-line priority access at the Vatican Museums and the Sistine Chapel. Start your hop-on hop-off tour from any stop and easily redeem your e-ticket upon boarding. Choose between a 24-hour and 48-hour buss pass. Learn about the Roman wonders with onboard commentary via complimentary headsets. Enjoy breathtaking, panoramic views from the upper deck of the bus as you drive past some of the most famous Roman monuments during your tour. Avoid the hassle of long entry lines with skip-the-line priority access tickets to the Vatican Museums and Sistine Chapel. Dive into world-famous art as you explore paintings and sculptures from artistic geniuses such as Vincent van Gogh, Paul Gauguin, Salvador Dalí, and Pablo Picasso. With this stress-free tour, all your transport logistics are sorted, saving you both time and money. Enjoy one or two days of flexible sightseeing and explore the eternal city at your own pace. Stay onboard and soak up views from the open deck, or hop off and on at various points of interest. Your ticket grants you unlimited use, meaning you can hop-on and hop-off as many times as you’d like. The Pink Bus Panoramic route consists of 9 stops, specially designed to take you on a tour of the city’s most popular points of interest. Conveniently visit popular attractions including the Colosseum, Piazza del Campidoglio, Spanish Steps, Piazza Navona, Trevi Fountain, Circus Maximus, Tiber Island, Vatican City, and St. Peter's Basilica. Via complimentary headsets, hear entertaining stories and facts about Rome. View a full map of the bus route here. At stop #6, conveniently hop off in Vatican City and prepare yourself for the experience of a lifetime. At the Vatican Museum’s entry, display your e-voucher to the security guard and head to the "CASSA ONLINE E GRUPPI" ticket counter (see map). Here, exchange the voucher for your physical priority access entry tickets. You are now free to explore the Vatican Museums and Sistine Chapel for as long as you’d like. From the monumental Gallery of Maps to Michelangelo's masterpiece on the walls of the Sistine Chapel, explore the ancient halls of the Vatican Museums and discover some of the greatest works of Renaissance art! The time you select upon checkout applies to your self-guided tour of the Vatican Museums and Sistine Chapel. 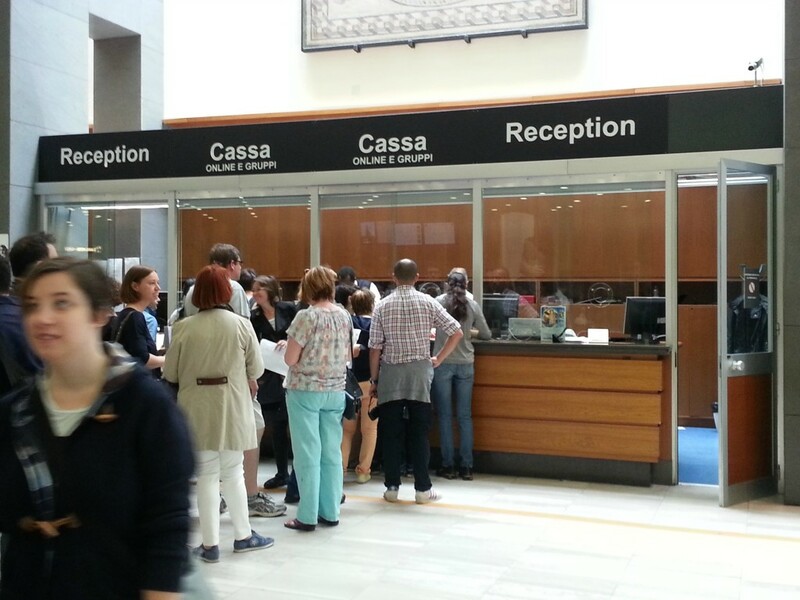 You will need to exchange your e-voucher for your physical tickets at the "CASSA ONLINE E GRUPPI" ticket counter inside the Vatican Museums (see map). Afterward, you are free to explore the attractions at your leisure. Please note, the museums close at 6 PM Monday - Sunday, and at 2 PM every last Sunday of the month. Rome’s Panoramic tour buses are open top double-decker, pink buses. They operate in all weather thanks to a detachable roof. Buses run daily at a frequency of 10/15 minutes. View a full map of the Panoramic Pink Bus Route here. All buses offer complimentary free. Laura was an excellent tour guide and very informative. The website is very User friendly. We booked some guided tours and hop on and off bus in Rome. The transactions were smooth and easy. Furthermore, if you download the app, they will credit 5 euro to your account. Also, you will get a 5% doscount code after you book your first tour. I would highly recommended it. Promptness, great English guide with a sense of humor and deep subject matter knowledge. You will receive an e-ticket via email. For the Hop-On Hop-Off Bus Tour, bring a printout of your e-ticket and easily redeem your bus pass from the driver upon boarding one of the pink double-decker sightseeing buses. You may start your tour from any of the 9 stops. View a map of the Panoramic Pink Bus Tour Route here. For the Vatican Museums and Sistine Chapel, no need to bring a printout. Scan your e-voucher barcode for your at the "CASSA ONLINE E GRUPPI" ticket counter inside the Vatican Museums see map). Afterward, you are free to explore the attractions at your leisure. Please note, you must enter the museum at the time slot you selected at checkout. Thereafter, you may stay as long as you’d like with operating hours. Your bus ticket is valid for duration selected upon checkout. Your 24/48 hours begins at the time of your first ride. Vatican Museums and Sistine Chapel tickets are valid for the date and time reserved at checkout.